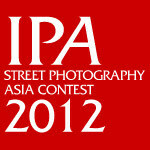 Vote for your Public Choice Award Winner, IPA Street Photography Asia 2012. You may vote for multiple entries. Public Choice Award Voting ends Sunday 1ST JULY at 11:59PM (UTC/GMT +8 hours). The entry which garners the most votes win the Public Choice Award.